With temperatures dropping across the Northern hemisphere, Terex Trucks’ top tips will ensure trucks beat the chill this winter. Winter is the time of the year when the relationship between man and machine is put to the ultimate test. From frostbite to fatigue failures, operating in extremely low temperatures where downtime is not an option is always a challenge. 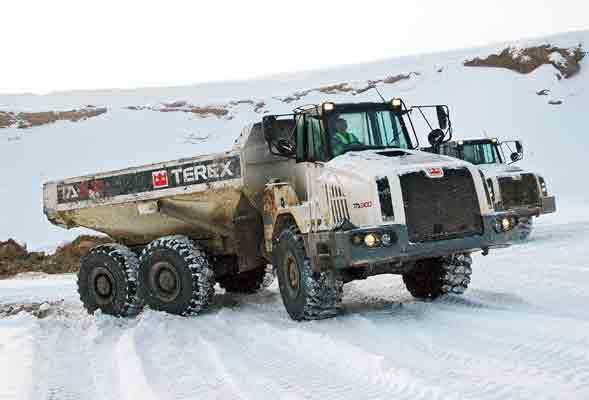 But here to help, and a veteran of temperatures of minus 30 degrees Celsius during winter in Siberia, Terex Trucks’ regional customer support manager, John Hunter has provided some key practices to aid safe operation, and prevent damage to off-highway haulers in the cutting cold. To avoid machine downtime or expensive repairs in the future, operators must not neglect air filtration, fuel, and lubrication. Hunter explains: “It’s important to drain sediment in the fuel daily as it’s one of the greatest causes of fuel injection system failures. In addition to cleaning the fuel tank and making sure it’s functioning correctly, the tanks must be full to reduce moisture condensation. It’s also good practice to keep a spare filter handy.” As diesel fuel is prone to gelling or waxing in cold weather, Hunter also recommends only using arctic oils that meet API specifications, fuel with the maximum cloud and points of 6°C or 10°F, and winter protection kits that make idling a thing of the past. To meet the needs of trucks working in extremely low temperatures, Terex Trucks has released two extreme cold weather protection kits for its rigid haulers. The first of the two Webasto-supplied kits, labeled Winter Kit, defends trucks working for prolonged periods where temperatures fall to -25 degrees Celsius, while a second, Arctic Kit, enables safe operating up to a deep freezing -40 degrees Celsius. Thanks to the truck-mounted Thermo-Heater, non-productive fuel consumption, engine wear-and-tear and prolonged downtime are significantly reduced, thus putting an ice pick through operating costs. The new technology makes use of an environment-friendly start-stop system, with just a very small amount of diesel consumed. The Thermo-Heater is powered once the engine is shut down, it then draws the coolant from the engine and circulates around critical components. The engine-independent heater has the ability to keep the machine’s vital organs at a pre-determined temperature for hours after the motor is switched off, ensuring a fuss-free restart even after prolonged exposure. With a career at Terex Trucks that dates back over 40 years, Hunter also recommends that cooling systems should be inspected weekly, in particular, the coolant reservoir and hoses. Throughout winter, a close eye should be kept on the coolant as it does so much more than simply stop the cooling system from freezing – it also increases the boiling point temperature, confines cavitation, averts corrosion and lubricates shaft seals. Finally, as well as protecting the machine from the elements, operators must also be adequately prepared to work in extreme conditions. No stranger to the big chill himself, Hunter says: “Wear as many layers of clothing as possible, which allow for comfortable movement. One thick layer of clothing is not as effective in insulating the body against the cold the way several layers can. Hunter reiterates that the first layer of clothing needs to be synthetic as opposed to cotton — synthetic materials take sweat away from the body while cotton absorbs it. The second layer should preferably be wool, the third should be weather-proof with good down insulation, and footwear must be waterproof and insulated. Operators can also keep the cold out with frequent drinks of warm liquids such as decaffeinated coffee, tea, hot chocolate, or broth. “Avoid caffeine when working in the cold, as it hinders the body’s heat-producing mechanisms, and causes the body’s core temperature to drop,” concludes Hunter. With a Terex Trucks career that dates back over 40 years, there’s not much that you can teach John Hunter. In his latest role, John is responsible for providing customers in North America with the best support available. A livelihood built on solid relationships and integrity, John previously dealt with clients in Russia before taking on his present role and has been with Terex Trucks since 1976. John joined the Scotland-based company as an apprentice and then moved to the engineering test department, before transferring to technical sales and finally settling in customer support. The areas he has covered in the past include Spain, South Africa, Australia, New Zealand and New Caledonia. Over the past two years, Terex Trucks has invested heavily in boosting the availability of parts stocks, systems, and specialists for customers in North America. Relocating such an authority on the products as John is yet another example of strengthening the support customers can expect. As such, customer responsiveness is at the centre of John’s role and is something he prides himself on. “I enjoy ensuring the customer is satisfied, so I make it my mission to bring any questions or issues to a quick resolution,” he says. Always willing to go that extra mile, since transferring to North America in May, John has already travelled to Quebec, New York, Ohio, North Dakota, Ontario, Manitoba, Alberta and British Columbia to meet with dealers to ensure customers are getting the most out of their machines.